Hepatitis B is a disease of the liver caused by a DNA virus that is known as the hepatitis B virus (HBV). The virus is in the genus Orthohepadnavirus in the Hepadnaviridae family. Hepatitis B can cause both a short term acute illness and a long term chronic infection that can eventually result in cirrhosis of the liver and even possibly liver cancer. Fulminant hepatitis, in which liver tissue becomes necrotic, does occur in 50% of people with hepatitis B. The incubation time for hepatitis B is about on average, 90 days. The hepatitis B virus causes viral hepatitis (inflammation of the liver) and is actually the second most commonly found cause of hepatitis in people. HBV also seems to cause other disorders including glomerulonephritis which affects the kidneys and polyarteritis nodosa that affects arteries in the body. Symptoms of hepatitis include nausea, abdominal pain, and jaundice (yellowing of the skin and whites of the eyes). People are infected with hepatitis B when they come into contact with bodily fluids of people who have the virus. This can take the form of contact with infected blood. The virus can also be transmitted through sexual contact. Tainted blood transfusions can be a problem. People who are injecting drugs are at a big risk, especially if they share needles with other people. Acupuncture and tattoos were a big problem in the past and have been implicated in causing many cases. Mothers who are infected can pass the HBV to their babies. This can occur when the babies are being born when they pass through the birth canal during a natural birth. Babies can be given the vaccine and treated with immune globulin if their mothers are infected. This helps prevent the babies from becoming sick with HBV. People can be diagnosed for HBV by testing for the hepatitis B surface antigen that can be found in the blood of those who are infected. Hepatitis D can also occur with Hepatitis B and in fact requires a prior infection with hepatitis B in order to infect the cell. Hepatitis B tends to cause a higher mortality from liver problems than does hepatitis C, however this can vary depending on what region of the world you are in and what if any vaccination program there is. There is a vaccine for hepatitis B which is recommended for babies and anyone under 18 years of age. This is a change from the past where only high risk individuals such as health workers, were vaccinated. Hepatitis C is a disease of the liver caused by an RNA virus that is known as the hepatitis C virus (HCV). 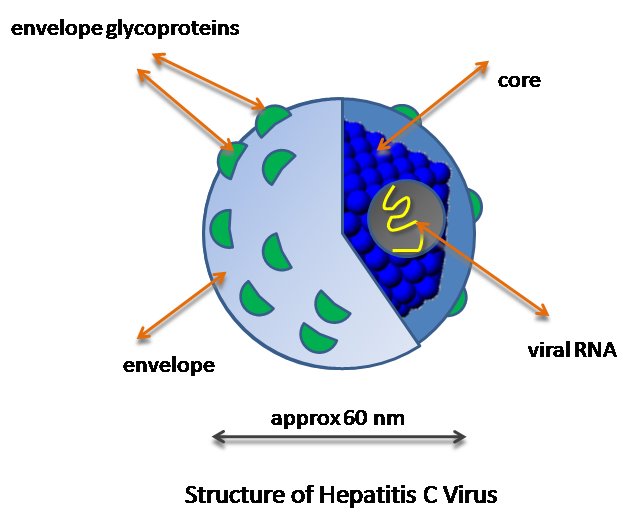 The hepatitis C virus is in the genus Hepacivirus in the family Flaviviridae. The virus remains in the liver in approximately 80% of people and can cause chronic disease, sometimes reappearing many years after the initial infection. HCV can also cause an acute form of viral hepatitis. Symptoms of hepatitis C are often very mild but can be similar to hepatitis B. The incubation time for hepatitis C is about on average, 45 days. HCV is usually transmitted by means of contact with infected blood. Tainted transfusions and intravenous drug injections are the main ways that HCV is transmitted. Sexual transmission is extremely rare in the transmission of HCV. Hepatitis C can lead to cirrhosis over time and also liver cancer, but fulminant hepatitis is rare. Chronic infection with HCV has also shown a link with increased risk of pancreatic cancer. It can be found at the same time as other disorders including porphyria cutanea tarda (type of skin disorder), cryoglobulinemia (high levels of immune globulin proteins in the blood) and glomerulonephritis (kidney disease). 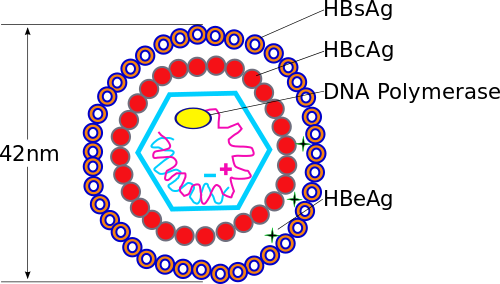 Hepatitis B is caused by a DNA virus while hepatitis C is caused by an RNA virus. Hepatitis B virus is in the genus Orthohepadnavirus (Family Hepadniviridae) while hepatitis C virus is in the genus Hepacivirus (Family Flaviviridae). The incubation time for hepatitis B is about 90 days compared with only 45 for hepatitis C.
While hepatitis B is commonly sexually transmitted, this is not the case for hepatitis C which is only rarely transmitted sexually. Hepatitis D commonly co-occurs with hepatitis B but it does not co-occur with hepatitis C.
Fulminant hepatitis is a common result of being infected with the hepatitis B virus, but it is not a common result of being infected with the hepatitis C virus. While there are two vaccines available for hepatitis B there is no vaccine available for hepatitis C.
Hepatitis B appears to be associated with polyarteritis nodosa while hepatitis C appears to be associated with porphyria cutanea tarda and cryoglobulinemia. Both hepatitis B and hepatitis C virus can cause hepatitis and both can lead to cirrhosis of the liver and liver cancer. Both hepatitis B and hepatitis C can be transmitted to someone when they are exposed to the blood of an infected person. A person can be vaccinated against hepatitis B, but this is not the case for hepatitis C which has no vaccine. Hepatitis D infection can co-occur with hepatitis B infection but not with hepatitis C infection. Fulminant hepatitis in which the liver becomes necrotic is a common outcome with hepatitis B but not with hepatitis C.
Dr. Rae Osborn. 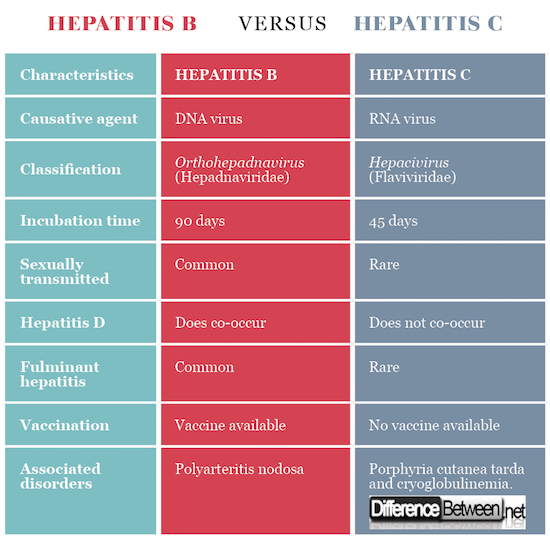 "Difference Between Hepatitis B and Hepatitis C." DifferenceBetween.net. April 2, 2018 < http://www.differencebetween.net/science/health/difference-between-hepatitis-b-and-hepatitis-c/ >. Falade-Nwulia, Oluwaseun, et al. "Comparative risk of liver-related mortality from chronic hepatitis B versus chronic hepatitis C virus infection." Clinical infectious diseases 55.4 (2012): 507-513.